Asad Baig's allround efforts helped Habib Bank Limited beat State Bank of Pakistan by six wickets in a low-scoring encounter in Karachi. SBP won the toss and elected to bat, but got off to a horror start, losing their first three wickets for just seven runs on the board, thanks to a double-strike from opening fast bowler Ehsan Adil. A 37-run stand for the fourth wicket looked promising, but Rameez Raja was caught by Kamran Hussain off Baig's bowling for 26. SBP would lose two more wickets with the score on 68, before finding themselves in the unenviable position of 79 for 7. Rizwan Haider and Hasan Mahmood fought valiantly to push the team to 106 for 7. Adil and Baig finished with two wickets a piece. Despite a double-wicket blow in the second over rendering Habib Bank 5 for 2, the chase was largely uneventful. Baig stroked a 21-ball 27 to give impetus to the innings, while Behram Khan supported him ably in their 33-run partnership for the third wicket. 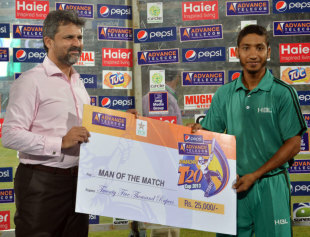 Hasan Raza later joined Behram in a 48-run stand to effectively take the game away from SBP. Humayun Farhat hit an 8-ball 20, including two sixes at the end to finish off the game in the 18th over, handing Habib Bank a six-wicket victory.